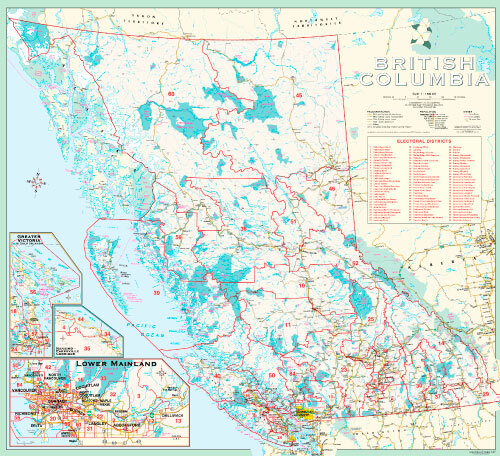 British Columbia Wall Map Including Electoral Boundaries 36"x40"
This edition of the British Columbia Wall Map is now available. Shows all current roads, highways and parks in BC. 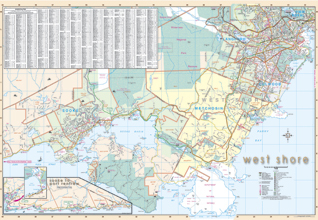 Showing all electoral boundaries in BC with a reference chart on the side. 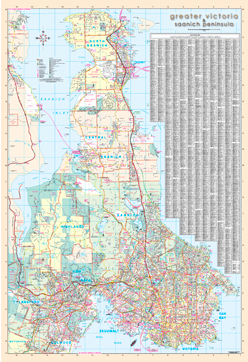 This comprehensive map is printed on a heavy matte stock with easy to read text. 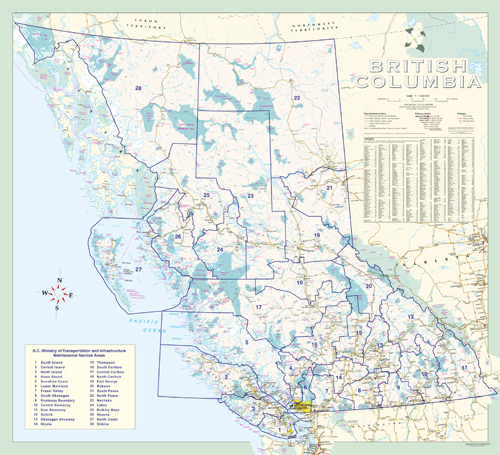 British Columbia Wall Map Including Highway Maintenance Service Areas 36"x40"
This edition of the British Columbia Wall Map is now available. Shows all current roads, highways and parks in BC. 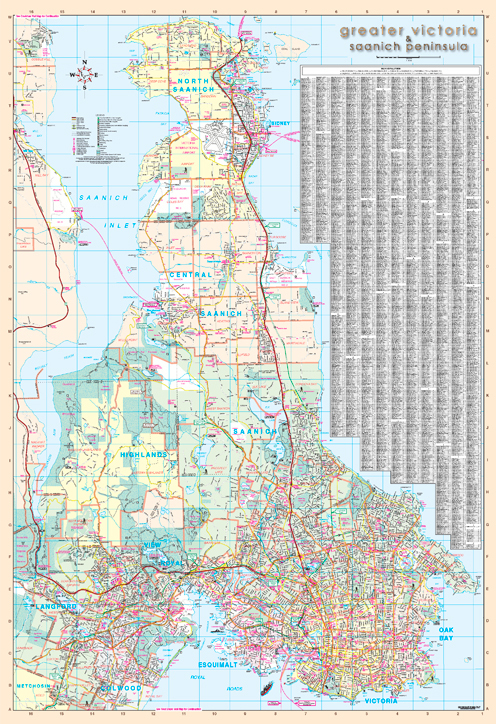 Showing all highway maintenance service areas in BC with a reference chart on the side. 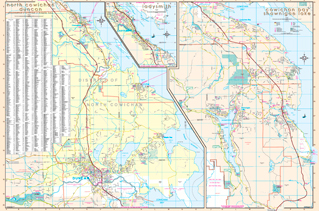 This comprehensive map is printed on a heavy matte stock with easy to read text. British Columbia Wall Map Including School Districts 36"x40"
This edition of the British Columbia Wall Map is now available. Shows all current roads, highways and parks in BC. Showing all school districts in BC with a reference chart on the side. 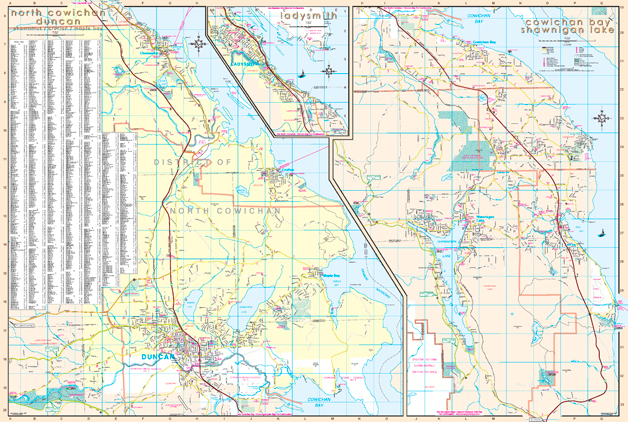 This comprehensive map is printed on a heavy matte stock with easy to read text. It is polybagged and shipped in a sturdy mailing tube. Victoria (Greater) & Saanich Peninsula With VREB Boundaries 36"x 52"
The Greater Victoria & Saanich Peninsula Wall Map displays in detail all streets and related features for 12 municipalities and major communities - Victoria, Oak Bay, Esquimalt, Saanich, View Royal, Colwood, Langford, Highlands, Central Saanich, North Saanich and the town of Sidney.as well as parts Metchosin. 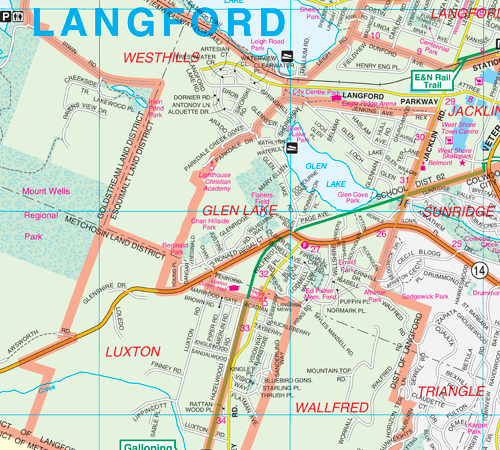 The map has a complete street index and also includes VREB Boundaries, Roads, Highways, Parks, Golf Courses and Cemeteries, Schools - Elementary, Secondary and Private, Hospitals, Police Stations, Fire Halls, Libraries, Shopping Centres, Community / Recreation Centres, Points of Interest and Visitor Centres. 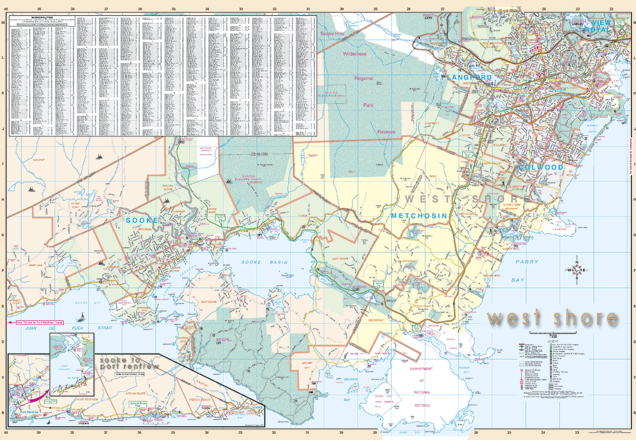 West Shore Wall Map (Victoria) With VREB Boundaries 36" x 52"
The West Shore Wall Map displays in detail all streets and related features for the "West Shore" municipalities which encompass Colwood, Langford, Metchosin, Sooke and View Royal. 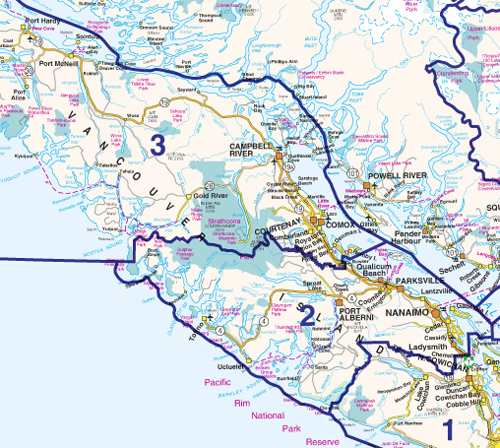 The map also includes a detailed inset from Sooke to Port Renfrew.. This version includes the VREB boundaries for the area. Related features include Block Numbers, Parks, Golf Courses and Cemeteries, as well as locations for Schools - Elementary, Secondary and Private, Hospitals, Police Stations, Fire Halls, Libraries, Shopping Centres, Community / Recreation Centres, Points of Interest and Visitor Centres. 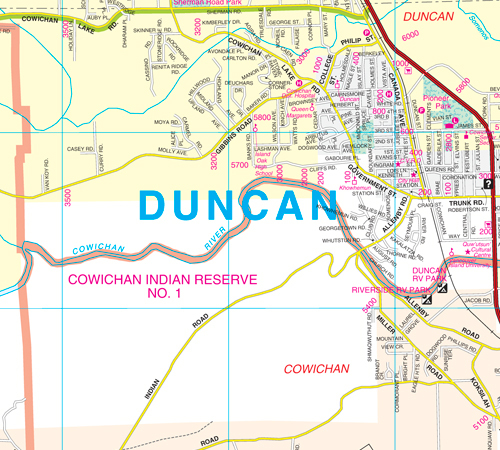 Duncan / Cowichan Valley Wall Map With VREB Boundaries 36" x 52"
The current Duncan / Cowichan Valley Wall Map is split into two sections to easily show Duncan to Chemainus and Shawnigan Lake to Cowichan Bay. 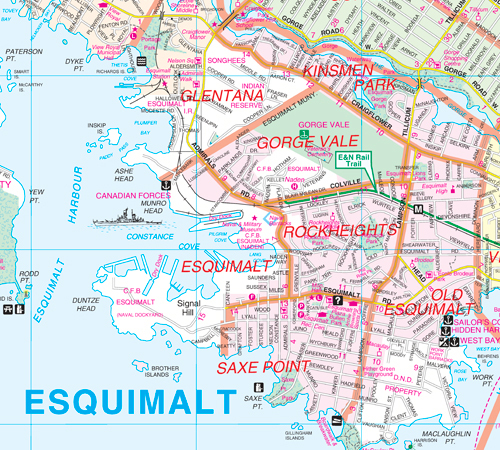 It details all streets and related features for these areas including Crofton, Maple Bay and Mill Bay. This version includes VREB boundaries for the area. Related features include Block Numbers, Parks, Golf Courses and Cemeteries, as well as locations for Schools - Elementary, Secondary and Private, Hospitals, Police Stations, Fire Halls, Libraries, Shopping Centres, Community / Recreation Centres, Points of Interest and Visitor Centres.